I absolutely love Fall and with Fall comes all those delicious warm soup recipes! This slightly adapted low carb recipe is from Beyer Beware Mother Running on Empty and it is absolutely delicious! 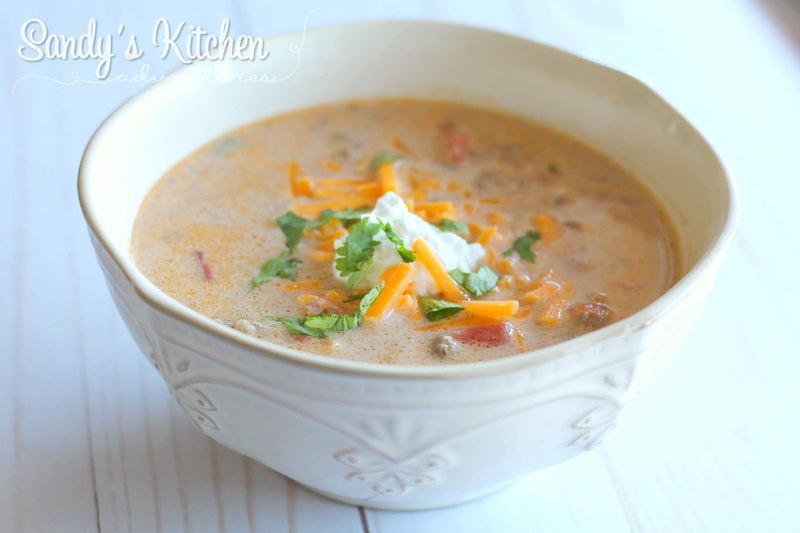 I decreased the amount of cream cheese used in the recipe and added plain Greek yogurt which allowed the soup to remain creamy without adding all the fat and calories. I also added Hidden Valley ranch seasoning mix which blended so nicely with the taco seasoning and plain Greek yogurt. I topped it with a little bit of sharp cheddar cheese and some chopped cilantro! It was pretty amazing! This recipe makes 5 large servings plus you can enjoy 2 additional Greens on the side! I had a cup of mini bell peppers from the air fryer. So yummy! Enjoy! Brown ground beef until fully cooked. While meat is cooking, place cream cheese, Rotel tomatoes, taco seasoning and ranch seasoning in the slow cooker. Drain grease from meat and put the meat in the slow cooker. Stir to combine meat with cream cheese and Rotel. Pour chicken broth over meat mixture. Before serving, stir in Greek yogurt. Divide portions into 5 servings (about 2 generous cups per serving). Add cheddar cheese (almost 2 tbsp per bowl) and garnish with cilantro (1 tbsp per bowl), if desired.